Orthopedics originally was the name given the subject of treating deformities in children; the original Greek term could be translated as “normal child.” But the medical world now uses the word to describe treatment of the bones, muscles, joints, and associated tissues of the body's locomotion apparatus. Orthopedic surgery, therefore, might involve repair of a broken big toe, as well as treatment of a whiplash injury to the neck. This section discusses disorders of the spine, including herniated (or “slipped”) disk, fractures, and torn ligaments. The spinal column of 33 stacked vertebrae is a common source of painful problems that require orthopedic treatment. In addition to helping support the weight of the body above the hips, the vertebrae are subjected to a variety of twists, turns, and strains during a typical day. Much of the nearly continuous shock exerted on the spinal column is absorbed by the gel-like disks between the vertebrae. 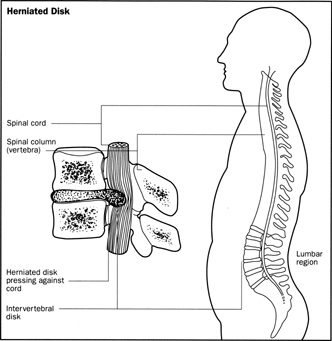 Eventually, one of the disks may herniate , or slip out of place, causing pressure on a spinal nerve. The result can be severe pain that radiates along the pathway of the nerve as far as the lower leg. The pain may be accompanied by muscular weakness and loss of reflexes, even perhaps by a loss of feeling in part of the leg affected by a pinched or squeezed nerve. This condition, known popularly as a slipped disk , has symptoms of low back pain or leg pain that are similar to those of other disorders, such as intermittent claudication, arthritis, strained muscles, and prostatitis. Also, a herniated disk can occur near the top of the spinal column with symptoms of head and neck-area pains. But more than 90 percent of herniated disk cases involve the lumbar region of the spinal column, in the lower back. Physicians usually can confirm a herniated disk problem by a technique called myelography , in which a dye is injected into the spinal canal and X-ray pictures taken. 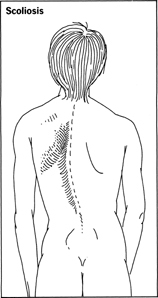 Another procedure, called electromyography , can help determine which nerve root is involved. Conservative measures generally are used at first to reduce the pain and other symptoms. They include bed rest on a hard mattress, medications, and sometimes the use of traction and back braces. If conservative therapy fails to correct the problem and the diagnosis has been well established by a myelogram, surgery may be advised to remove the herniated disk. The surgeon may recommend a procedure called spinal fusion , in which the edges of several of the vertebrae are roughened and a piece of bone from the pelvis grafted onto the roughened edges. The bone graft will fuse with the vertebrae and in effect make the several vertebrae a single bone. 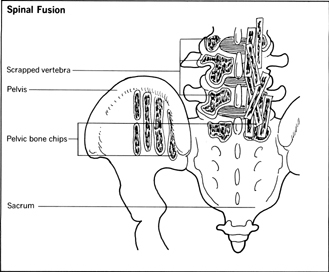 However, the fused vertebrae will not interfere noticeably with body movements after the fusion is completed, which takes about six months. The operation requires a hospital stay of from one to two weeks and the patient must wear a body cast for the first few weeks and then use a back brace for a period of possibly several months. The patient usually can return to work and resume some normal activities within a couple of months after the operation. Strenuous activity, however, is usually restricted after an operation on the spinal column. Spinal fusion surgery also may be used to correct two other kinds of spinal disorders. One disorder is known as spondylolisthesis , a condition in which one of the vertebrae slips out of alignment. Spondylolisthesis usually occurs at the bottom of the group of lumbar vertebrae, where that section of the spinal column rests on the sacrum. The other disorder is scoliosis , or abnormal curvature of the spinal column. If the case of scoliosis is mild and causes no severe symptoms, it may be treated with conservative measures such as braces and special exercises. Surgical treatment of scoliosis may involve not only spinal fusion but reinforcement of the spinal column with metal rods attached to the vertebrae to hold them in proper alignment. Disorders of the cervical portion of the spinal column, in the area of the neck, may cause symptoms similar to those of a herniated disk in the lower back. But there is pain in the neck and shoulders and weakness in the arms. Surgical treatment also is similar, with removal of a herniated disk portion or fusion of cervical vertebrae when conservative therapy, with bed rest, neck braces, and medications, does not prove helpful. Many fractures of the spinal column also are treated by fusion operations, use of casts, braces, bed rest, or traction, in addition to therapy directed toward the specific problem. Spinal fractures frequently are compression fractures of vertebrae caused by falling in a sitting or standing position or mishaps in which a bony process of a vertebra is broken. Spinal fractures that result in permanent damage to the spinal cord, with resulting paralysis, are relatively uncommon. Fractures of the long bones of the arms and legs are treated by a method called reduction , the technique of aligning the broken ends of the bones properly so the healing process will not result in a deformity. Reduction also requires that the muscles and surrounding tissues be aligned and held in place by immobilizing them as the break heals. If the break is simple enough, the limb can be immobilized by putting a plaster cast around the part of the involved limb after the fractured ends of the bone and associated tissues have been realigned. In complicated cases with a number of bone fragments resulting from the fracture and surrounding tissues in some disarray, the patient usually is given a general anesthetic while the surgeon recognizes the shattered limb like a player assembling pieces of a jigsaw puzzle. If some of the needed pieces are missing, the surgeon may fill the gaps with bone from a bone bank, although bank materials usually are not as effective in the healing process as pieces of the patient's own bones. A common technique of modern fracture surgery is the application of wires, screws, pins, metal plates, and other devices to provide internal fixation of a broken long bone during the healing process. Nails and pins may be used to fasten the fractured neck of a femur, the long bone of the upper leg, to the shaft of that bone. A steel rod may be driven through the shaft of a long bone to align the broken sections. Screws may be used to hold together bone ends of a fracture in which the break runs diagonally across the shaft. Screws also may be employed to hold a metal plate or strip of bone from the patient's own body across the break. The screws, nails, and other devices generally are well tolerated by the body and may be left in the bones indefinitely if they do not cause adverse reactions after the healing process is completed. Traction frequently is employed to hold a limb in alignment while a fracture is healing. A clamp sometimes is placed at one end of the fractured limb and a weight attached by wires over a pulley is connected to the clamp. Depending upon the kind of fracture and type of traction prescribed, a system of several weights and pulleys may be rigged around the bed of a patient to fix the bone and related tissues in correct positions. Joints of the body can be vulnerable to damage from sudden twisting and turning actions, particularly when the force of the individual's body weight is added to the pressure on the joint. The effect of such forces on the knee joint can result in tearing of the half-moon-shaped cartilages that cushion friction of the upper and lower leg bones where they are joined. Sports fans are particularly aware of the vulnerability of the knee joint because of the high incidence of knee injuries to athletes, especially in football and basketball. Obese individuals are also particularly liable to develop cartilage problems in the knee. When a cartilage of the knee joint is torn, the patient may feel pain and weakness in the area of the injury. Swelling usually occurs, and in more than half the cases the knee cannot be straightened, because it has become “locked” by the cartilage. There may be a remission of symptoms, but surgery frequently is required sooner or later. The surgeon makes an incision in the area of the kneecap and cuts away the torn cartilage. Full recovery takes several weeks after the first few postoperative days, during which the patient remains in bed with the affected leg elevated. Special exercises are required to overcome muscle weakness in the leg and to help the patient learn to use the leg with part of the cartilage cushion missing.